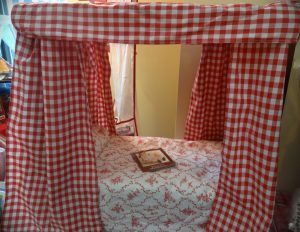 Includes wooden canopy-style bed, red gingham detachable canopy, red gingham curtains, mattress, pillow, and a delicate red and white floral printed counterpane. 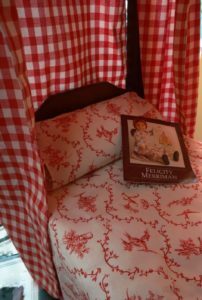 Includes wooden canopy-style bed, red gingham detachable canopy, red gingham curtains, mattress, pillow, and a red and white floral printed counterpane. Note sale does not include doll in photos.